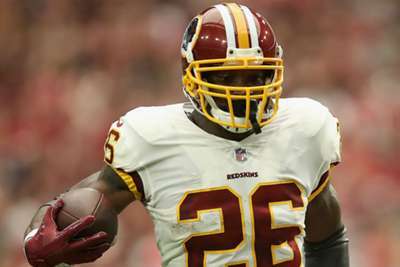 Washington Redskins running back Adrian Peterson wants his NFL career to last beyond the 2018 season. The 33-year-old was a free agent for most of the offseason before he signed a one-year contract with the Redskins in August. Peterson has said he does not see himself retiring after this season. "Three to four more years would be ideal," Peterson told ESPN. "Not to say it hasn't been done before, but not at a high level. So of course I plan on playing three to four more years, and I plan on playing those years at a high level as well." Peterson struggled in 10 games with the Arizona Cardinals and New Orleans Saints last season. But he shined in his Redskins debut, rushing for 96 yards and a touchdown in their Week 1 win over Arizona. The 12-year veteran said he still has goals he wants to accomplish in the NFL. "The best player ever to play is my mindset," Peterson said. "Being able to sit back and say I had a great time playing the game I love and I won a world championship and I was the best at my position." Peterson added he is aiming to be the top running back in the NFL this season. “Of course, there's a lot that I have to prove in order to be able to show that,” Peterson admitted. “Inside, I know that I feel I am. It's just about doing it for a full season."